The largest wildfire in California history, the Thomas Fire started near (Saint) Thomas Aquinas College, about eight miles from Meher Mount and northwest of the city of Santa Paula, on Monday, December 4, 2017 at 6:26 p.m. The fire was and is driven by winds up to 80-miles-per-hour, years of drought, warm temperatures, and extremely low humidity. In its first few days it burned the wilderness between the towns of Ojai, Santa Paula and Ventura, including all of Sulphur Mountain, where Meher Mount is located. It also burned structures in the cities of Santa Paula, Ojai and Ventura. It is clear the fire visited nearly every part of the of Meher Mount. Manager/Caretakers Buzz and Ginger Glasky were amazed at how the fire line seemed to stop at critical points. In short, the fire brushed past the buildings and equipment, even touching a trellis at the Visitor Center. Both the Visitor Center/Caretaker Quarters and the Topa Topa Patio are intact, although the smoke damage is not yet known. Baba’s Tree suffered major damage, but its base remained standing. Detailed assessment and repair of the water system is needed. Meher Mount also benefited from effective weed and fire hazard abatement thanks to Manager/Caretakers Buzz and Ginger Glasky. As the fire broke out Monday evening, Buzz and Ginger could see the flames from Meher Mount. Around 10:30 p.m. that night, they evacuated safely to downtown Ojai with their Airstream travel trailer. That night they parked at the home of former Manager/Caretakers Leslie and Samantha Bridger who had recently moved back to Ojai. On Tuesday, December 5, everyone waited to find out the fate Meher Mount. At 6:51 p.m. that evening, the fire map showed that Meher Mount was in the fire zone. 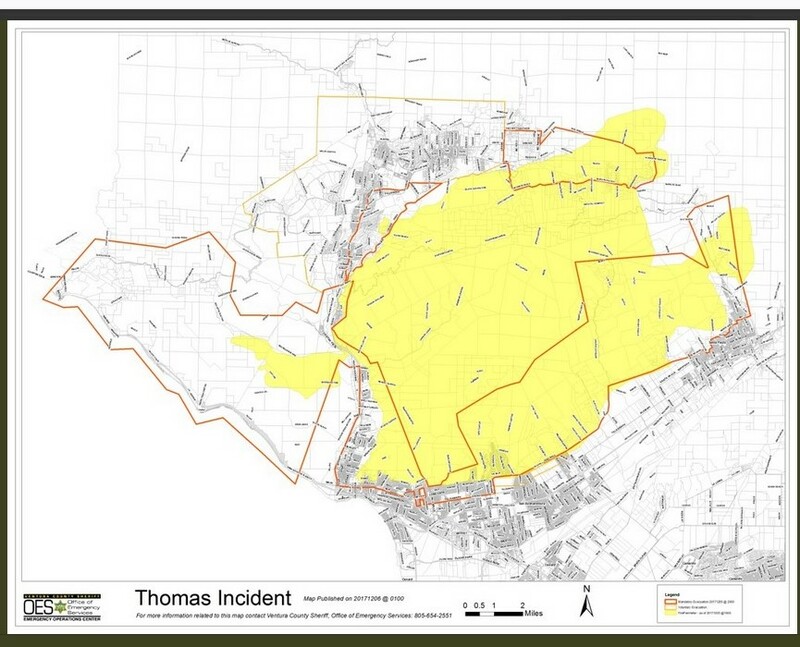 THE THOMAS FIRE LINE, as of Tuesday, December 5, 2017, included Meher Mount in the burned area. A VIEW OF THE LARGER THOMAS FIRE AREA also on Tuesday, December 5, 2017. Meher Mount is located near the top and to the right of the yellow-shaded area. The structures at the bottom of the map are in the cities of Ventura (left) and Santa Paula (right). The structures at the top of the map are in the cities of Ojai and Meiners Oaks. On Wednesday, December 6, Buzz and Ginger moved from moved their Airstream from downtown Ojai farther north to a RV park in Santa Barbara. They said the smoke in Ojai was terrible. The car and Airstream were covered with ash. "It looked like it had snowed," said Buzz. Meanwhile, a lawyer who lives on Sulphur Mountain Road, TrevorQuirk@quirklawyers, began posting videos of Sulphur Mountain Road on Twitter. He encouraged Sulphur Mountain residents to call him for a report. Since his videos did not include Meher Mount, Board Chairman Sam Ervin called his office to see if he could check out Meher Mount and report back. At about 2:45 p.m. on Wednesday, Sam received a voice message from Trevor Quirk who reported that from what he could see, the Visitor Center was intact. On Wednesday, when Buzz and Ginger learned that residents were allowed back in they drove to Meher Mount to assess the damage. They went again on Friday, December 8. The following account is based on their observations from those two visits. It appears that the Thomas Fire hit Meher Mount sometime just after Buzz and Ginger evacuated the evening of December 4, 2017. The Glaskys believe the largest and tallest part of Baba’s Tree was knocked over by the 80-mile-per-hour winds. It fell to the ground and then burned in the fire that came up the slope from the South. Buzz thinks the remainder of the tree may survive, though it will be considerably shorter and smaller. He said the part that fell was hollow inside about 20 feet from the base. It may have been a blessing this happened when no one was under the tree. Baba's Tree had already been weakened from the 1985 New Life Fire. 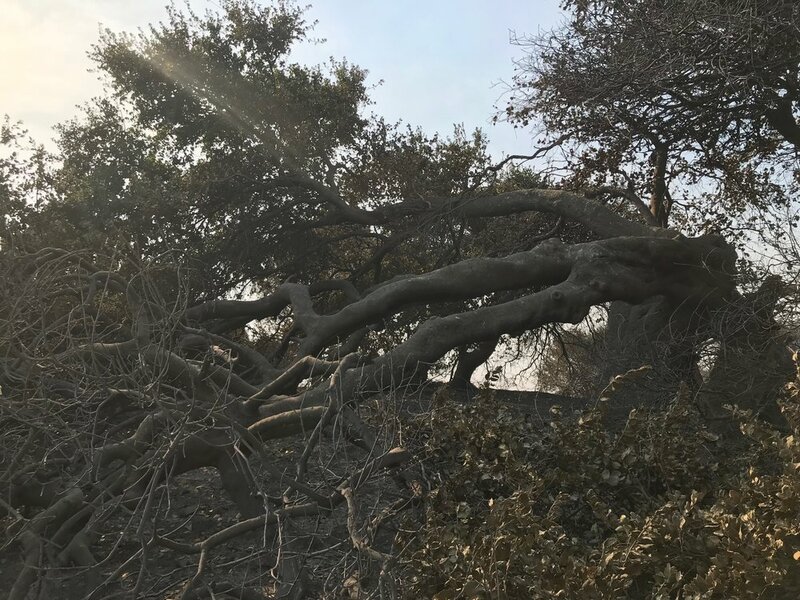 Meher Mount plans to consult with a professional arborist who has expertise with Coast Live Oaks (Quercus agrifolia) for advice on how to nurture and help Baba’s Tree survive and grow. This tree survived the New Life Fire in 1985, 32 years ago, so it is a survivor. 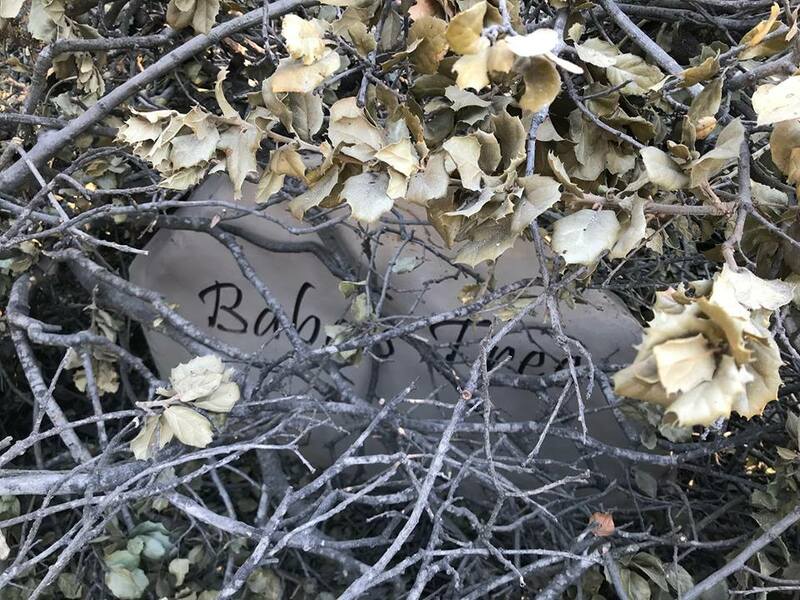 It is Baba’s Tree, so we will see what He has in mind. The fire came right to the edge of the Visitor Center/Caretaker Quarters and the Workshop/Topa Topa Patio. A small part of the wooden verandah trellis at the Visitor Center burned and fell off. The rest of the Visitor Center/Caretaker Quarters was not burned, but hot ash blew under the doors. Buzz considered it a minor miracle the curtains did not catch fire. The part of the trellis that burned fell to the ground, so the fire did not spread further onto the trellis and the building. A dead tree stump about one foot away from the Topa Topa Patio burned to ash, but left the patio intact. The tractor and other tools and equipment were untouched by fire. Both the Workshop and Visitor Center were very smoky inside. The fire fighters had clearly been to Meher Mount, as there was a ladder against the house, and the entry gate had been removed from its hinges. Meher Mount will not know how damaged the water system is until the power is back on, which Southern California Edison estimates could take one-to-three months. Water from the well will not be available until power is available. Therefore, Meher Mount may not be open for an extended period. When Buzz and Ginger visited, they had to walk down the canyon to the wellhead because several fallen and burned trees were blocking the Well Road. 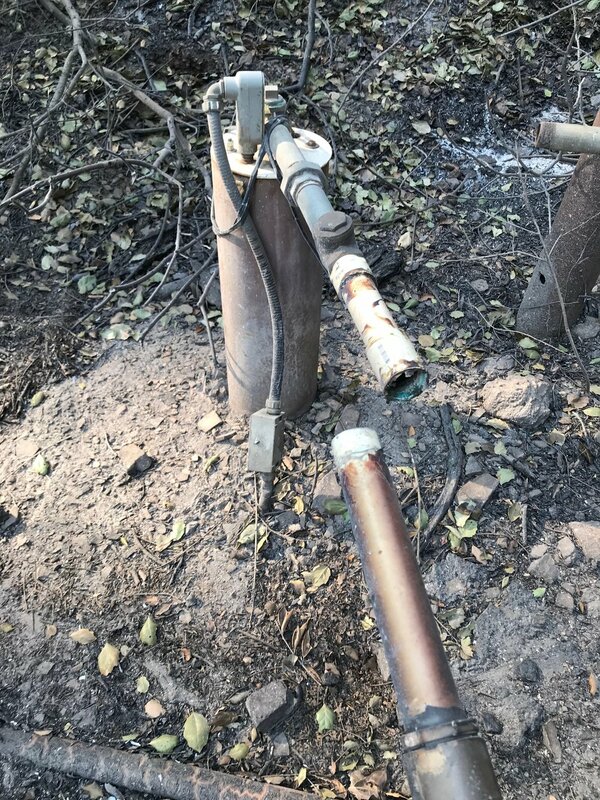 The electrical panel at the well, which was new in 2016, and the wires and PVC pipes will need to be repaired or replaced once power is restored to the mountain and down to the well. Power lines are down, the poles burned, and fallen trees lie across some of the lines. There may be other damage not yet seen. The water treatment system by the pool appeared relatively intact, although some PVC pipes melted and the ozonator burned. Not all the damage at Meher Mount will be covered by insurance. Your donation makes it possible to fully restore Meher Mount as place of pilgrimage. In an ideal world, Meher Mount will be open for Amartithi (January 31) and Baba’s Birthday (February 25). Please help make this happen with your generous donation. The damage from the Thomas Fire is very specific. Because all the buildings remained in tact, there is not much debris. The clean-up us surprisingly very minimal. There will be, once Meher Mount and the insurance company have assessed the damage, specific areas of repair and replacement. If you would like to volunteer, contact Sam Ervin at sam.ervin@verizon.net. Skills that will be needed include plumbing, carpentry, electrical, gardening, and landscaping. Thank you to those who have already offered to help when the time is right. The Thomas Fire, driven by powerful Santa Ana winds, continues burning to the north of Ojai, threatening the cities of Carpinteria, Summerland, Montecito and the edges of Santa Barbara. As of Monday, December 11, 2017 at 7:00 a.m., the Thomas Fire had burned 230,500 acres and was only 15% contained. To date, 794 structures have been destroyed, 187 structures damaged, and 18,000 structures threatened, according to CalFire. Current estimated firefighting cost is more than $38 million. Fighting this fire to date are 6,397 total personnel, 856 fire engines, 113 fire crews, 27 helicopters, 67 dozers, 48 water tenders. The cause of the fire is unknown. Meher Mount is temporarily closed due to fire damage. On Friday, December 22, 2017, the Thomas Fire became the largest wildfire on record in California. "The Thomas fire broke out in the foothills above Thomas Aquinas College in Santa Paula on Dec. 4. Fueled by 50-mph winds, the fire swept into downtown Ventura, burning hundreds of homes that first morning. "For the next two weeks, the fire ebbed and flowed with the winds. It swept into the Ojai Valley but spared the resort town. Then it moved up the southern Santa Barbara County coast, where firefighters made a stand in the hills above Montecito. "Despite heavy winds, the fire only destroyed a few homes — and officials said hundreds of others were saved." - "Thomas fire becomes largest willdire on record in California," by Michael Livingstone & Javier Panzar, The Los Angeles Times online, December 22, 2017. On December 29, 2017 at 8:22 a.m., CalFire reported that 281,893 acres were burned, and the Thomas Fire was 92% contained. There were 1,068 structures destroyed and 280 structures damaged. On Saturday, June 2, 2018, a headline in the Los Angeles Times read "Thomas fire, state's largest, officially out after 6 months." 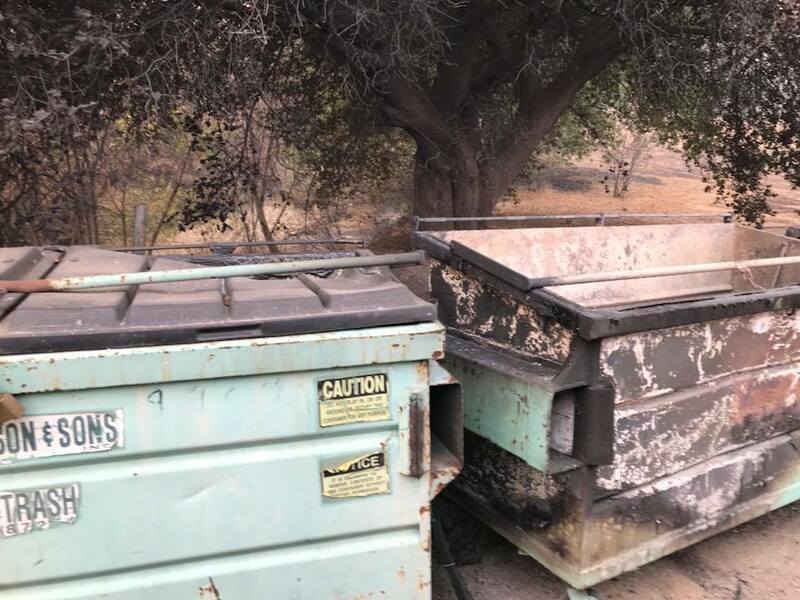 The article reported, "Los Padres National Forest officials declared the Thomas fire extinguished Friday [June 1, 2018] after no hot spots had been deteced within the permeter for more than two months." The fire burned 440 square miles, and more than 1,000 strcutures were lost before the fire was fully contained on January 12, 2018. Two people, including a firefighter, were killed. "Will You Allow Meher Baba to Burn You Out?"